GLD Billiards Reno Billiard Table - 7 ft.
GLD Billiards Fat Cat Frisco Billiard table - 7 ft.
Modernized arcade style is what the Tucson is all about. The added bonus for this table is the easy ball return. Now you can play as if you were at your pool league but in the comfort of your own home. 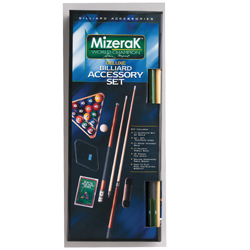 Complete your billiard set with one purchase. The Deluxe Billiard Package includes everything you need to get the ball rolling.